back south. Then then the 40’ rigger fired again with Brad’s Black Jack and Big Al Blk/pearl followed by 7 color reg Flounder Pounder UV 8# king and 3 set dipsy 23’ loc coho rig Blk/Purple peanut. We were 7 for 11 before 6AM and thinking this will be a short day. Wrong. The bite died and almost 2 hours before the next one hit the box. We continued north past the wreck and turned back south at 9.0 north. Heard someone went 5 for 6 in short order 120 fow so took that contour south. 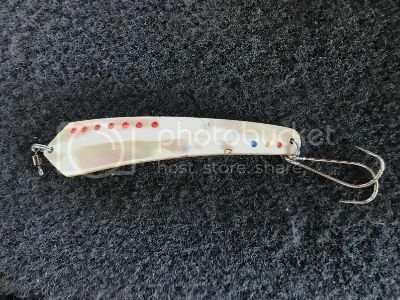 Picked up a Lake Trout on a 5 color on a UV taped Raider regular Chicken Pox that missed on two previous bites. We just kept pecking away and eventually went back a shallow as 35 feet and still marking bait and fish. One of my crew brought along an assortment of spoons that were handmade from natural shells and sent to him from the gentleman who carves them in Japan. He gets twenty some dollars apiece for them so I was reluctant to try then for fear they would work. The bites were slow so we put one on a 5 color and not long after it took a 15.5# brown! Oh my so put another on a rigger and that took a coho. The spoons look a bit like the old Apex spoon and have a nice erratic action and super shiny polished finish. Wish I could afford a couple but too many others in my assortment to justify. Coho are definitely spreading out and the bite has slowed but this is that time of the season. 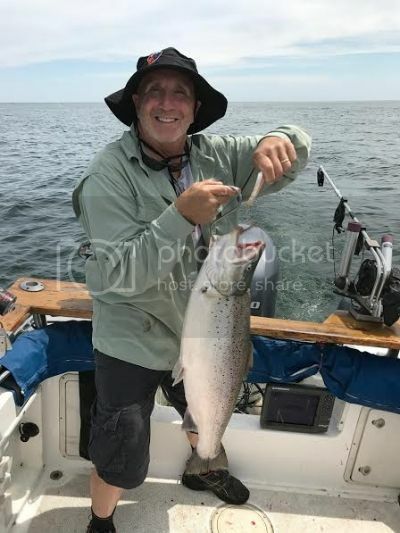 Also reports of good Coho action as far north as Algoma when most years they seem to move east by the time they reach Sheboygan. We ended up 15 for about 22 with 1 king, 1 LT, 1 brown and the rest Coho and fished until 130. Forecast for the next week iffy so not sure when I will get back. Retired guys wait for good weather. We are of about the same vintage. Yes, things are different here but most of us would take the quantity bite we are blessed with re coho time vs a couple of 25# kings. I'm sure your Lake Onterio tactics will get you your fair share of bites. You didn't say which port you like to fish out of. I'm aware of vet outings by the clubs out of Port Washington Ozaukee county club, Milwuauke GLSF and Racine's Salmon Unlimited. I'm sure you would enjoy that. You might consider joining one of the fishing clubs near you. Likely you would meet good people who would like to fish with you or take such an experienced guy such as your self out.